Happy Friday, and Happy Phone-A-Friend! In lieu of working on my paper that is due tomorrow, I'm emailing the both of you to get decorating advice! Dillon and I have been in our place for a year now and just re-signed our lease. We made a ton of home improvements right when we moved in last year, despite it being a rental, because we planned on being here for a while. We're glad we did all those projects up front so we could enjoy the space right away, but one room that has eluded us all along is the bathroom. We're just not sure where to begin and that is because we've been cursed with a bathroom of blue, and by blue I mean: blue wall tiles, blue floor tiles, blue tub, blue sink, and blue toilet. Let it be known that none of these blues necessarily match. As of now we've made no improvements to the bathroom. We're currently using a shower curtain from a previous apartment that Dillon hates and that doesn't necessarily go with the bathroom or add anything to the space. We've had lots of different ideas, but none of them have really stuck. 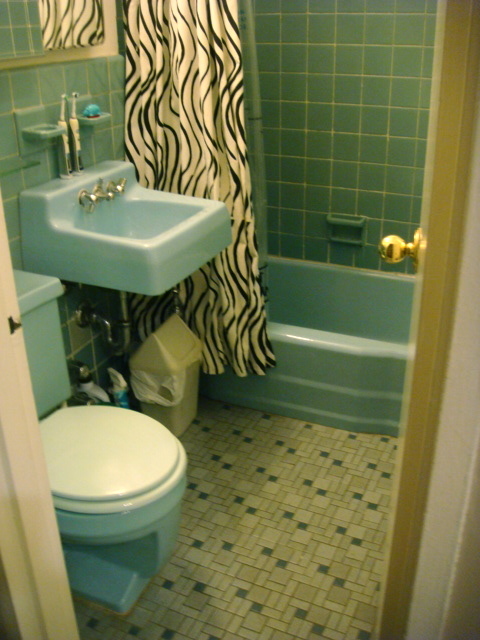 If I had a dollar for every time I've googled 'blue tiled bathroom' I'd be rich! Any specific product recommendations or color scheme suggestions would be GREATLY appreciated. To Kristin we say: HOLY BLUE BATHROOM BATMAN! 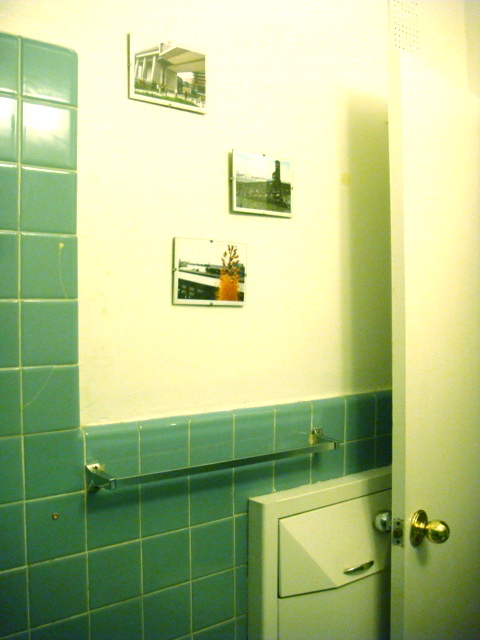 Unfortunately, this bathroom is pretty typical. Who hasn't lived with pink/grey tiles of the same generation. Yellow and brown? Avocado? What were they thinking! Well, here's what we're thinking: Let's start with a cool new shower curtain, because the rest of the decor can be easily filled in from there. Instead of trying to work with the blue and match what is already un-matched... let's kick it up a notch and make the shower curtain the center piece. This one from Bloomingdales caught our eye and led us to some more (and cheaper) ideas. This way, when people walk into your bathroom, the blue will just play a supporting role, to your giant elephant or the like. We leaned towards floral (Dillon, are you game?) because it breaks up the geometric nature of all the different tiles. If you add more small print, it might get a little dizzy. Then, you can pull a coordinating color from the shower curtain pattern, almost anything really, for the wall color, or just leave it white/neutral. Instead of the three small frames on the wall opposite the sink, we recommend added a larger print or piece of art to really fill that space, and again distract your eye from the blue. 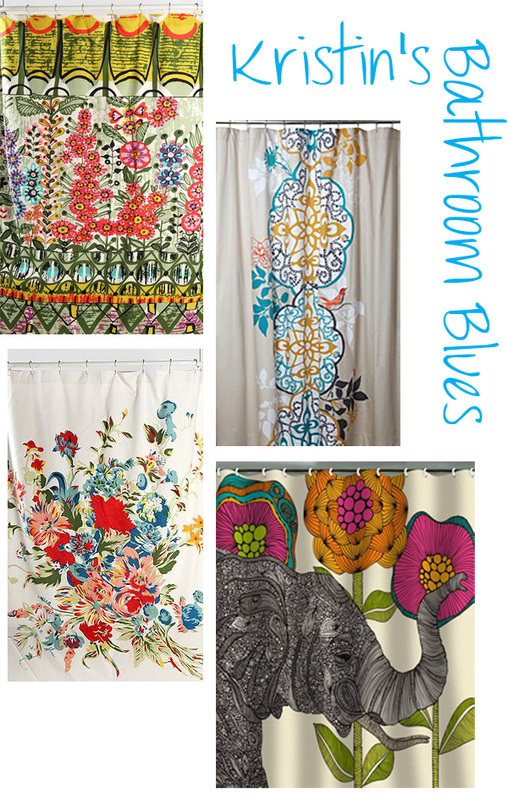 Love your idea for the Perpetual Blooms Towels from Anthro. 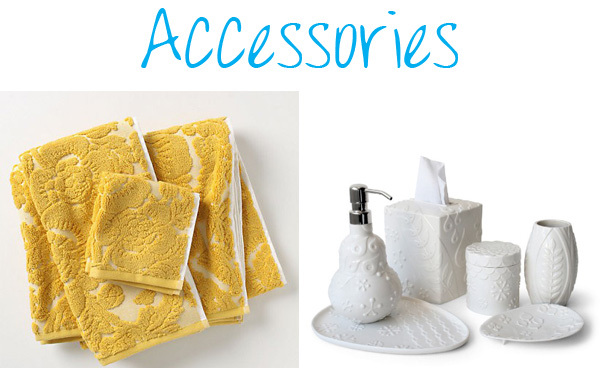 And Blythe found these gorgeous bath accessories from Jonathan Adler that are divine! We love the stark white with some texture to keep it interesting. Regardless of what you decide, Kristin... keep us posted! We'd love to see the transformation! I hear Kristin's FACE is blue.